Our Products >> SHOOTING AMMO, Single Cartridges, Packages & Boxes >> PISTOL Calibers, Boxes & Packages, CenterFire Shooting Ammo >> INCH! Calibers, Pistol Boxes & Packages, CenterFire Ammo >> .45 Auto Rimmed, .45 ACP Rimmed, Boxes of 50 >> .45 Auto Rimmed, 1 Box of 50, CLOSE OUT all Sales Final. History of the 45 Automatic Rimmed Cartridge: The 45 Automatic rimmed, aka 45 ACP Rimmed and .45 Auto Rimmed is a rimmed version of the 45 Auto (ACP) cartridge. In World War One, Colt and Smith & Wesson produced revolvers that used 45ACP cartridges by placing the 45 Auto or 45 ACP (Rimless) cartridge into a moon clip before loading them into the revolver. Peter's Company in 1920, produced the first rimmed version of the 45 ACP and named it the 45 Auto Rim. Today it is considered an obsolete cartridge as none of the major ammunition makers are producing it, although a few small companies still do produce it when brass is available. 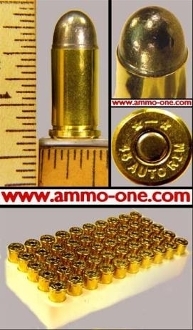 .45 Auto Rimmed, 1 Box of 50, CLOSE OUT all Sales Final.